Why should women be interested in a career at Man Group? Why do women succeed and flourish in their careers at Man Group? As part of their response Man Group gave us time to meet some of their team. Amendeep told us her story which is reprinted here for you. If you are interested in Careers at Man Group please contact Robyn Clarke. “A fantastic, meritocratic culture and supportive pastoral care helped me move through the ranks”. I’ve been at Man Group for nearly 18 years and people call me a ‘lifer’. I don’t mind that though, I enjoy working here - “if it isn’t broken, why fix it?” and this organisation has been incredibly supportive to me over the years both professionally and personally. I started as a financial engineer in 2001, dealing with portfolio construction and the financial modelling of funds. I then moved through the ranks at Man Group, as my role quickly evolved into working closely with the Investment Committee at the time, and I was soon responsible for running the portfolio implementation and rebalance processes for the multi-manager business. Over time, I began to work closely with the then Chief Operating Officer and heads of department to refine business processes and governance. In late 2009, after much change at Man Group, I was approached to move into Group Risk and became a Group Operational Risk Manager, working closely with the Chief Risk Officer, Chief Financial Officer (CFO), General Counsel and other C-suite managers as I became Secretary to the executive Risk and Finance Committee. More recently, I have been promoted to Head of Group Operational Risk. I say ‘moved through the ranks’ but in actual fact, Man Group has a relatively flat structure and isn’t too concerned with job titles and seniority. It’s definitely a meritocracy and I’d like to think that’s how I’ve achieved success in my career. I work hard and I’m conscientious, I take the initiative and I’m good at managing people all of which my managers have recognised. As a result, I’ve had plenty of new challenges and opportunities come my way. 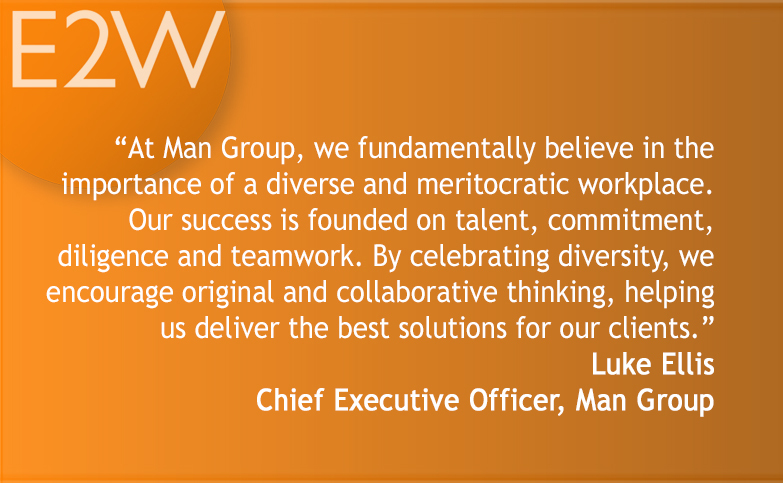 Over the years at Man Group, I have made great friends and enjoyed being part of a hardworking, collaborative and supportive culture. In 2009, as well as changing my role, I got married and moved homes and then, in late 2010, I found out that I was pregnant. It’s over the last nine years that Man Group’s ‘pastoral care’ and fantastic culture has really demonstrated its strength to me. They have made sure I feel valued by including me in new initiatives whilst away from work, but never pressurising me to return. They have been supportive and understanding when I’ve been at real low points. Chief Financial Officer: “I don’t need your CV, I know exactly how capable you are. I want to understand how your plans for returning to work are going? To which he told me an anecdote about his own family. It really made me reconsider my plans and I will always be very grateful for that personal and honest advice. He suggested I return for 2/3 days a week, use the fact that my maternity cover was still in place and ease myself back in gently. And that was fantastic advice. I returned in the March and reached full-time in the June. 2015 was a difficult year but Man Group helped me through it again. Two days after my second son was born in January 2015, I faced the most heart-breaking news: my brother who had been in intensive care for the last month was unlikely to pull through and he died the next day. Man handled it really sympathetically, keeping their distance but letting me know that they and the counselling services they had access to, were there for me as and when I needed them. When it came to returning from maternity leave, from experience and from their actions, I knew I had the support of my management – I used a combination of my KIT days again and accrued leave to ease myself back in to the working world. These days, I try to help those more junior to me grapple with maternity leave and the subsequent return to work several months later. Mothers’ working days look different – they may have to leave earlier and log on later; they may want to work from home more; they may need reminders on technical issues at work when they first return. This is all fine. I’ve learnt that the biggest battle is with yourself: that feeling of being judged when you leave early even when no one notices; always wanting to be successful; wanting to be present; and wanting to do your job to the best of your ability. And now I’m about to go on maternity leave again. As Head of Group Operational Risk, I feel so much wiser about how to handle my maternity cover and maternity leave. I know what I need from someone doing my job whilst I’m away which makes the recruitment process both easier, and harder! I will say that I’ll be off for the twelve months but if past performance is anything to go by, I may return sooner. But when I do, I’ll ease myself back in rather than returning full time immediately knowing that I have the support of Man Group, my managers and colleagues, and that my career can continue to flourish.